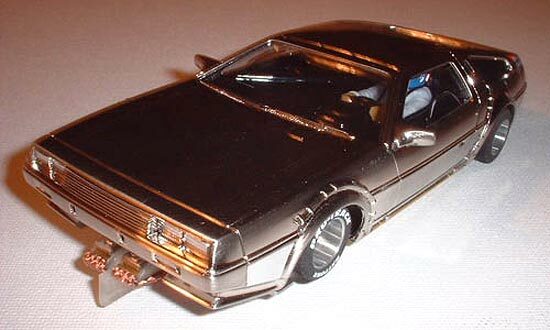 Russ Toy starts off the New Year with a blast from the past; the 1982 DeLorean. Here's another car for the gallery, a DeLorean hardbody based on "Back to the Future" movie. I was looking around the hobby store for my next hardbody project when I came across this model from Polar Lights. 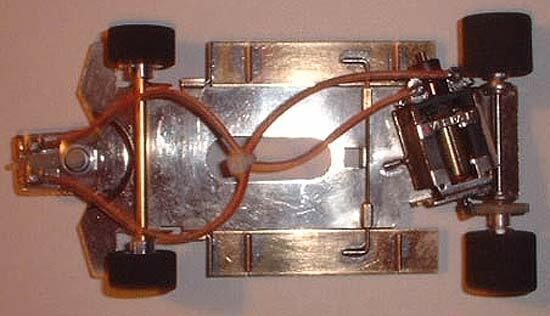 I asked if I could open it and when I did, I saw this beautiful one-piece plated body that screamed "SLOT CAR". Of course, I had to buy it. 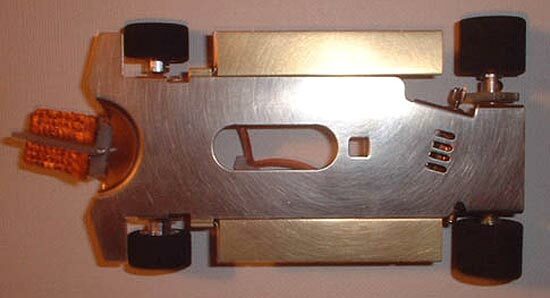 Using the same Astro center section as I did for my Ferrari 348tb, I made some brass pans to fit underneath the body with the same type of movement. The body was lower about 1/8" and the front was cut out to make room for the guide flag. The molded holes on the front and rear fenders were covered with chrome R/C decal, scuffed to match the stainless steel finish. The other body parts snap-in including the windshield, but did not have the rear glass. I use .010" lexan for the glass and taped in the side rear windows with packing tape. It's clear enough so you can't even detect it. The tires are the five-slot wheels from Pro/Track with the rears cut to .700" wide in order to fit under the body. The motor is a Parma 16D set-up with a 50 deg Pro/Slot armature; a lot of motor for a hardbody (maybe too much). Initial testing of the DeLorean showed good handling on the road course. This may not replace the Ferrari 348tb as my primary race car, but it will be a close second.